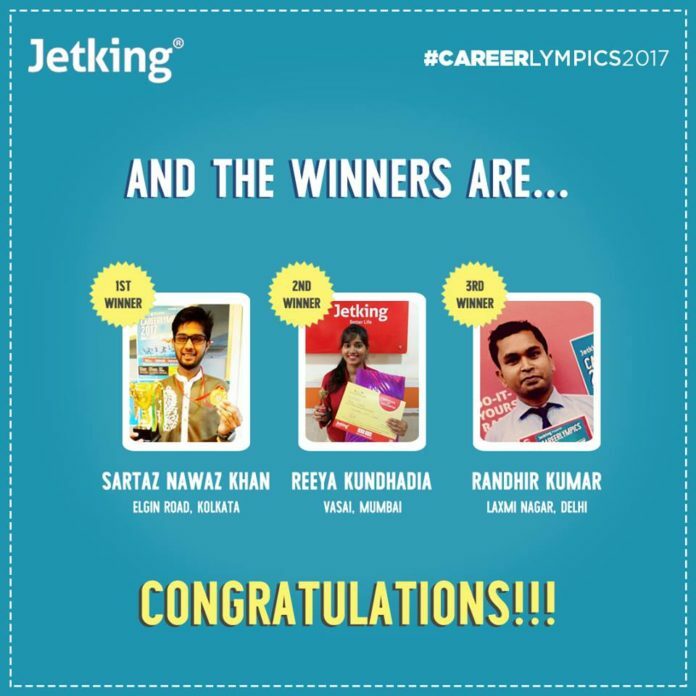 Mumbai: Jetking, leading institute in digital skills and networking training, has recently announced the winner of India’s first career championship, Careerlympics 2017 contest. With the aim to make students career-ready, Jetking had organised India’s first-ever national championship across India. The event witnessed rewarding and a learning experience for each participant. The event which commenced on 11th of September and concluded on 17th September received more than 15,000 registrations. The winners of the Careerlympics 2017 contest are Sartaz Nawaz Khan, Reeya Kundhadia, Randhir Kumar and will be felicitated with exorbitant prizes like Bike, iPhone, trip to Goa and scholarships. Careerlympics2017 was one of a kind national-level career guidance activity for students to engage in a jovial way with exciting prizes to be won. The competition was open to all and students from across India participated in the competition in all Jetking centres in the country. Careerlympics 2017 was a 5-day contest, where the students had gone through a daily challenge. Post that the individuals were assessed through a panel interview followed by a Q&A round and an aptitude test thereafter. About Jetking: Jetking is a leading institute in digital skills and networking training. It is a BSE listed company Headquartered in Mumbai, providing top quality recruits for the talent starved IT companies across India. A pioneer in the pool of skill development, Jetking is an established name in the market with over 100 successful centres in India and also forays into the international markets. Jetking has trained 7,00,000 students so far and plans to triple that number by 2020 as per their tie up with NSDC. With an annual turnover of about 70 crores, their current business partners include IT behemoths like Microsoft, Cisco and IBM amongst others. Their wholesome and quality obsessed training methodology is their major USP. They cater to the needs of Accenture, TCS, Airtel, Wipro, Infosys and Capgemini to name a few.